"Seventeen people in my school died. And I'm here to march for all of them," Marjory Stoneman Douglas freshman Brooke Harrison told ABC News' "Nightline." I'm in D.C. So joaquim didn't die for nothing. This is what this is all about. Reporter: They arrived with their loved ones to March for those who couldn't. I don't even know what's going to be happening there. I just know that we all need to be together. Reporter: Tell me why you're here today. I'm here because I want things to change. Reporter: The students of parkland. Each with a story and a purpose on their biggest day yet, at the March for their lives. The crowds are stretches as far as the eye can see. The crowd is revved up. And they're ready. Welcome to the revolution. Reporter: On stage, an all-encompassing chorus. We say no more! Reporter: Representing many whose lives have been touched, from an elementary student from Virginia. I am here to represent the African-American girls whose stories don't make the front page of every American newspaper. Reporter: To a high schooler from south Los Angeles. I learned how to duck from bullets before I learned how to read! Reporter: How would you describe the energy and emotion of the crowd that came out to D.C. Today? I think we're all just fed up and that we want things to change. We're ready for things to be done. And if people don't want to do it, we'll do it ourselves. Reporter: But people questioning whether this move the political needle. Fight for your lives before it's someone else's job. I heard the first shots, first seven or eight. And just heard more and more and more. I could hear that the shells cracking, because when a gun shoots you kind of can hear the cracking of the shell. My brother was in a class above me. He said my teacher's dead. I just told him, don't move. And I love you. And we're going to get out of here. It was kind of like my whole future was just like wiped out. Thought it was all a dream. I woke up the next day thinking, I was going to text him or something, and I just couldn't. The day after was my birthday. And my boss saw me. He said, dude, you're completely changed. You don't look like a kid anymore. I could just see it in your face. I said, I know. Reporter: The unimaginable, yes, S yet increasingly familiar dominated the news cycle. But their time, the students refused to give up their storey. Their cell phones as weapons in a battle that suddenly struck home. Barely a week after the shooting they headed to the capital, demanding more than just thoughts and prayers. Are you willing to actually act on anything? Reporter: That same day in Washington, Sam zeif with these powerful words for the president. I don't understand why I can still go into a store and buy a weapon of war. Reporter: And two weeks later the world watched as these students went back to school. I have no idea what it's about to be like when I walk in. Cause we can't go back to normal. Reporter: Far from the spotlight, some of the first and seemingly impossible steps to rebuild what life once was. A rec. Basketball league, stepping back on the court for the first time since the shooting. One of the students, Joaquin Oliver had hand-picked this team before he was gunned down. And he asked his dad, Manuel, to be his coach. Dylan wore his best friend's Jersey, Joaquin's number two. He played in the Jersey. All those games felt different. Take care, buddy. Still doesn't feel right. We were all only there because of him. Just like clicked right away, you know. Like kind of corny, like love at sight, but I swear, I swear. Reporter: Victoria Gonzalez was Joaquin's girlfriend. She said it still felt like he could walk through the door any minute. Like he's faking it, whatever. It's like, I don't even, all the days of this month have merged together. Reporter: In grief, time trekked onwards, and on a state level, progress for some. The governor has just signed a new bill to put in place some gun restriction. Reporter: In part, age restrictions and a controversial program to arm some teachers. Four weeks after the world learned the name "Parkland", a quiet morning at Brooke Harrison's home. Today marks the anniversary of when the shooting happened. So we're going to have 17 minutes of silence at the football field of my high school. 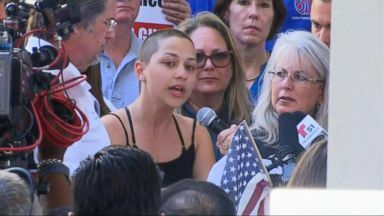 Reporter: Hours later, Brooke and her fellow students walked out of their classrooms, demanding change, joined by 3,000 other schools around country. But for Victoria, her focus wasn't on the political. Her struggles to get through each minute of every day. I'm just not ready yet, you know. I definitely want to be a voice eventually. But I need to build them up first. Reporter: On Saturday, hundreds of thousands descended on Washington in what is said to be the largest protest against gun violence in U.S. History. They know if there is no assault weapons ban passed then we will vote them out. Reporter: Under the signs. Justice for Douglas! Reporter: Through the chants, Victoria seemed to be finding that voice she knew was there all along. We're all here from parkland to March for Joaquin and all of the kids around America. Reporter: Do you feel like you are getting closer to finding your voice as an activist? Before I walked out there today I didn't tell anyone how I felt about guns. Once I walked out there today I knew exactly what I wanted to say. So I've definitely taken a step forward. Reporter: What emotion are you going back on that bus with. Right now I'm feeling inspired. Because there are so many people that are teenagers. We're standing up for what they believe in. It just shows you that anyone can do it. If teenagers from high school can do did we can definitely do it. Reporter: Normalcy shattered in six minutes. Teenagers turned act vests in six weeks. You're either for us or against us. If you're against us, you're out. 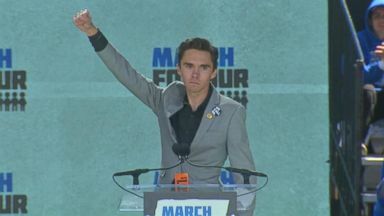 Reporter: For "Nightline,"
Marjory Stoneman Douglas High School student David Hogg spoke at the March for Our Lives rally in Washington, D.C.
New surveillance video released reveals the moments that followed at Marjory Stoneman Douglas High School after a gunman started opening fire at the Parkland, Florida, campus. 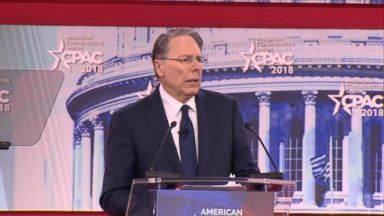 Wayne LaPierre took the stage at the Conservative Political Action Conference on Thursday roughly a week after a deadly mass shooting at a high school in Parkland, Florida.